In a dramatic end to the regatta Alinghi have taken out Act 3 despite being T-boned by Red Bull Sailing Team that knocked the Swiss boat out of the racing. The crew of Morgan Larson, Anna Tunnicliffe, Nils Frei, Pierre-Yves Jorand and Yves Detrey watched the final races from the dock. Later the international jury awarded the he Swiss boat a redress. “We were lining up at the start, and approaching the line with ten seconds to go and most of the fleet was on port. Red Bull ducked behind us, the winds were shifty and up and down, there was too much of a puff and they couldn’t get the bear away and T-boned us. It’s great to have won, we had such a great regatta that it was bittersweet to end that way. I think we earned it so it feels good. We’re just glad that no one was hurt and that the boat is repairable,” helmsman Larson said. A change in race format saw the fleet race in groups of six for safety reasons with gusts up to 25 knots blasting across the racecourse, in what proved to be a day of mixed fortunes. Realteam have been the model of consistency this week, staying out of trouble and keeping their noses clean to take a well deserved second place. “It’s a great result. It’s our best result since starting in the Extreme Sailing Series. The team was strong from the beginning of the event and we finished very well in these crazy conditions! We sailed the boat well, had good boat handling, good starts and we finished well. We have some stuff to improve on, we need to look to beat Alinghi who have taken the lead over everybody, and we want to reach the podium again,” said Skipper Jérome Clerc. The young guns on Emirates Team New Zealand have kept in touch with the top of the leaderboard all week. Peter Burling, who took over from Dean Barker in Qingdao, kept a cool head today to hold off the defending Series champions The Wave, Muscat to take third place. The Kiwis are now well positioned to topple the old order on the overall Series leaderboard. “We’re pretty stoked to get on the podium. I think going into today there was a bit of a battle between three of us to get into second position, and I suppose there’s a little disappointment that we couldn’t get there. Coming into the start of the week we would have been pretty happy getting a third, so as the week goes on you seem to up your expectations – but overall we’re really happy to come away with a podium and keep in contact with the top guys on the overall Series rankings,” Burling said. Leigh McMillan and The Wave, Muscat, who have been a dominant force in the class over the last two seasons, were left feeling despondent after missing out on the podium by just one point. This is the first time since Singapore in 2013 that the team missed being on the podium. The pressure is now on McMillan as the fleet next heads to Russia and Alinghi is now two points ahead on the overall Series leaderboard. “We took opportunities when they arose and we are still banging in second and thirds so it gives us confidence moving forward. It’s a nice position to be in and with Russia being the next event, being the home team it will be very exciting, and hopefully it won’t take us three days to warm up! Bring on Saint Petersburg,” said British helmsman Paul Campbell-James. Today Ben Ainslie and his crew showed the gold medal winning form that they have struggled to find this week, with two race wins for the British team, who between them boast six gold medals, upgrading their position to seventh overall. “Every day there has been a completely new set of conditions to race in, the wind was always slightly different which made it a real challenge for all the teams. It is intense racing with the short races and courses and we are working together to master the style of racing. Overall this event we had some good days and some not so good days, today was obviously a really good day for us. 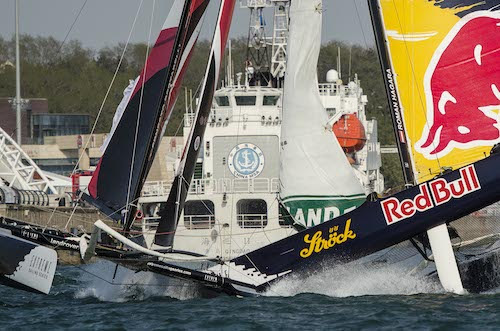 We feel like we are slowly making gains and moving forward, which is what we want to do to be in the top half of the fleet at the end of the season,” Ainslie said. Arguably the best offshore sailor in the world right now, Franck Cammas, showed great form at the first two Acts of the Series in Singapore and Oman, but couldn’t replicate that this week in Qingdao, finishing the regatta in eighth place, just one point behind J.P. Morgan BAR. 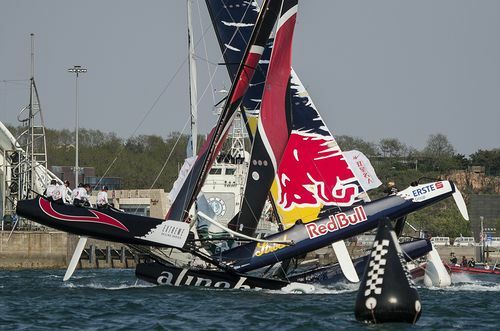 It was a tough end to the Act for the Austrians on Red Bull Sailing Team too, and after knocking themselves out of racing following today’s collision, the team had to settle for ninth place. SAP Extreme Sailing Team also struggled to master the tricky and challenging Qingdao racecourse this week, finishing the Act one point behind the Austrians in tenth. David Gilmour and the young Aussie team on GAC Pindar had a baptism of fire in their first full event racing together as a team. The local boat Team Extreme Qingdao more than earned their Extreme 40 stripes this week, drawing in the home crowds and impressing, particularly on the opening day, where they finished the event in third. “The crew did a really great job considering we had limited training together. They were really mixing it up until the end, so we’re pretty happy with our result although we were in the middle of the fleet for most of the regatta, we finished down the back end – but still not out of reach. So all in all we’re very pleased with guys performance this week,” said Skipper Mitch Booth. Over four days Qingdao has thrown everything at the fleet, and is not an Act that will easily be forgotten. Next stop for the fleet is Saint Petersburg in Russia in June, where the season will reach its halfway point.